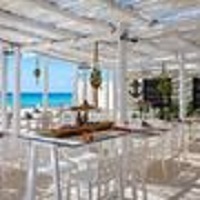 This all-inclusive resort is on the beach overlooking the Caribbean, 8km (5 mi) from Cancun’s restaurant and entertainment district, across the street from AquaWorld Marina. Fiesta Americana Condesa Cancun All Inclusive’s 2 cascading pools and 10-person spa tub complement the beach. Miiluma Spa provides rejuvenation for adults, while children enjoy supervised activities. Onsite conveniences include free WiFi throughout and 4 restaurants serving regional and international cuisine. Air-conditioned guestrooms feature ocean, garden, or lagoon views and contemporary Mexican decor. Amenities include marble bathrooms with showers only, Internet access via both high-speed connections, and LCD televisions.